Can you explain the LabScan XE 0:45 inverted geometry? 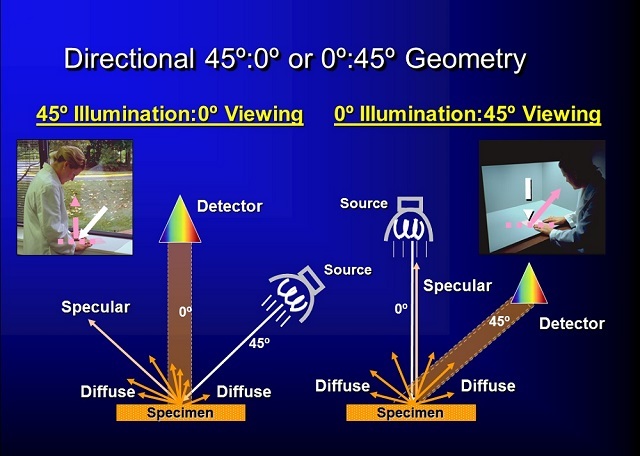 Directional 45:0 versus 0:45 geometry for color measurement instruments. The directional geometry correlates best to visual evaluation of the sample. In a directional 45:0 instrument geometry (a d/8 diffuse sphere would be the same concept), the port is over-filled or flooded with light and the imaging diameter of the lens serves as the field stop for the optical system. The general rule is that the viewed sample area defined by the measured area of the lens is always smaller than the completely illuminated port diameter on a directional 45/0 or d/8 diffuse sphere geometry. This way, your sample view does not include the edge of the port causing masking of the sample. One of the intriguing aspects of colorimetry is that for every rule, there is an opposite rule…. and this is the case here. In a 0:45 directional geometry instrument such as the LabScan XE, the lamp is behind a zoom lens that traverses up and down to illuminate different areas of sample view at 0 degree illumination (on a line perpendicular to port plane). The 15 fiber optic collectors arranged in a circumferential ring at 45 degrees, view or measure the entire area of the port, such that the area of sample view is actually defined by the illuminated area of the sample which is always smaller than the port diameter. FAQ: What are the advantages of a 0:45 versus 45:0 directional geometry instrument? The CIE recognizes the directional 45:0 instrument geometry as being equivalent to the inverse directional 0:45 geometry, everything else being equal. Here are a couple of features where the 0:45 geometry offers some special advantage. 1. The VSI option on the LabScan XE 0:45 allows greater than a 10:1 range of viewed sample areas allowing a high degree of flexibility in measuring different sample sizes. The rule of thumb in colorimetry is always to measure the largest sample area possible as this facilitates the best optical averaging of the sample area. However if your samples are limited in size, or vary a lot in size, having such a wide range of sample viewing options is very helpful. 2. Some UV brightened applications require the use of a UV cut-off filter in the light path and it is easy to design a 0:45 geometry instrument to have the filter in front of the lamp in front of the zoom lens so it applies to all viewed sample areas.